Dutch supermodel Doutzen Kroes may have clipped those infamous Victoria's Secret Angel wings but her latest editorial turn for Paris Vogue suggests that she is still in sublime shape. 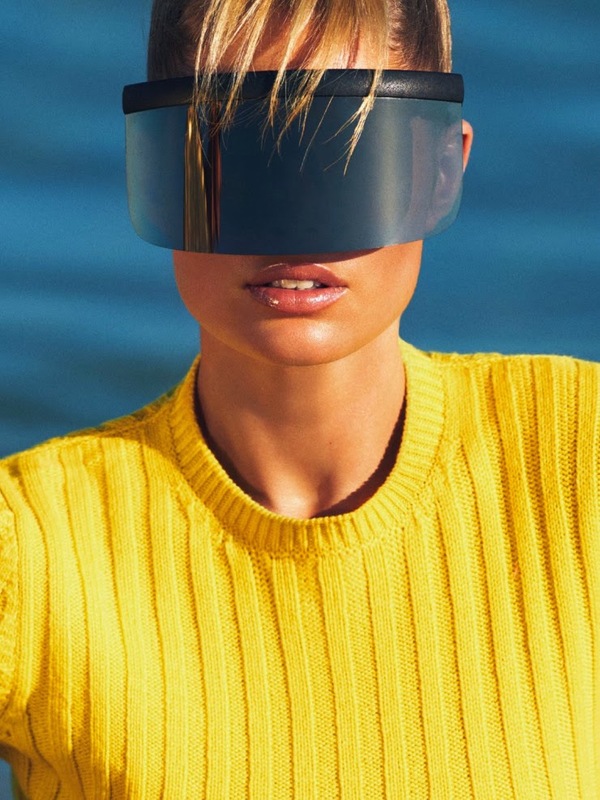 Photographer Gilles Bensimon traverses familiar ground paying tribute to the 80's inspired American Elle editorials featuring the Original Body Elle Macpherson. Kroes takes on Amazonian-like proportions as she dons bathing suits, figure-hugging bandeau mini-dresses, and eye-catching sun visors selected by fashion editor Géraldine Saglio. The thirty year old mother of two has been a modelling stalwart since her arrival in New York in 2003. Kroes has left no stone unturned in a career spanning over a decade with cover appearances for the Italian, French and American editions of Vogue, countless editorial tears, and blue chip campaign slots for Calvin Klein, Dolce & Gabbana, Gucci, Valentino, Versace, and Blumarine. Pre-modelling Kroes harboured ambitions of becoming a professional speed skater and maintains her healthy physique following a fitness regime called 'Ballet Beautiful' which strengthens the core muscles that define a ballerina's body. With her ongoing role as a spokesperson for L'Oréal and recent editorials for WSJ, Dutch Vogue, and an opening slot at Fendi's Fall/Winter 2015 show, Kroes' industry relevance shows no signs of diminishing.